Top seed Novak Djokovic warmed up for the French Open with a comprehensive 6-4, 6-3 victory over Roger Federer to claim his fourth Italian Open title on Sunday. "I know I can play better," said Federer. "Novak was rock solid today, he played great throughout. He made very few unforced errors. I'm happy, feeling good and healthy. "It's a little bit frustrating, but in general I'm satisfied with my performance. I played a good match but Novak was just a little bit stronger than me. "Physically, I know I'm in good form and I hope I give myself the chance to play better in Roland Garros than I have in recent years." In the absence of seven-time champion Rafael Nadal, ousted in the quarter-finals, the Serbian produced a near flawless performance on centre court to defend his title and hand Federer his fourth final defeat in Rome. With Roland Garros a little more than a week away, Djokovic could emerge as the favourite to claim what is an elusive title in the French capital, especially in light of Nadal's current woes on clay. The Spaniard has won only one title on the surface this year, at Buenos Aires, and been beaten by Italian Fabio Fognini, Andy Murray, Djokovic and Switzerland's Stan Wawrinka in recent tournaments. Djokovic, meanwhile, has brought his game to boiling point this week to claim his fifth title of the season and take his head-to-head record with the Swiss ace to 19-20. On this performance, Djokovic will be hard to beat at the French Open, where Nadal's bid for a 10th title could be compounded by a lack of top seeding. Djokovic is on a 37-match winning streak at the highest-level tournaments and after he took his winning streak this year to 22 matches. The Serbian traded blows with Federer from the opening stages and, at 5-4 ahead, converted his first break of the set with a return winner that clipped the edge of the tramline. 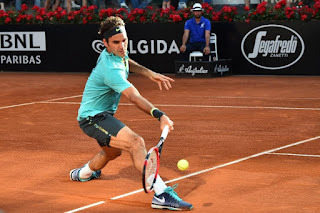 Federer was not without some choice shots of his own, the classy Swiss powering a backhand winner down the line to save a second break point in the second game of the second set. But Djokovic's precision, power and pace looked unstoppable. He took the early lead with a break for 2-0 and, after taking a three-game advantage behind a total of 30-12 baseline points won, was never in danger. Djokovic secured his fourth Rome trophy in 76 minutes as Federer struck a forehand wide on match point. The Swiss, who mulled skipping the tournament before making a last-minute decision to play, admitted Djokovic was simply too strong on the day. 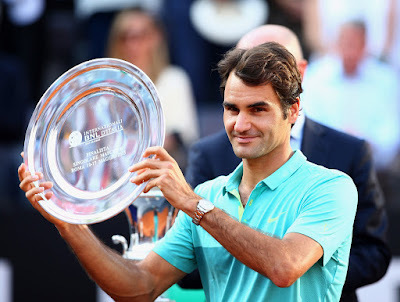 Federer, the only man to break Nadal's formidable winning streak in Paris, in 2009, but who has lost four French Open finals to the Spaniard, hopes he will be among the challengers this year. The Swiss walks away with 600 ATP Rankings points. He is now 85-44 in tour-level finals, including 23-18 in ATP World Tour Masters 1000 title matches.